You can now register for free (see below) for the annual Oxford Dementia Research Day jointly organised by NIHR Oxford Health Biomedical Research Centre and Alzheimer's Research UK Oxford Local Network. CPD credits to be applied for. There will be a full day of talks (programme to follow) covering subjects including cellular and clinical research, managing dementia and cognition. There will also be poster sessions through the day with plenty of time for networking and an evening reception. Early Career Researchers are invited to join us for a post-conference social in the St John’s college bar, with special guests from MedComms, Editing and Industry who are there to chat and answer your questions about their career paths. We will also have free drinks available for ECR network members, including a special Moji-tau cocktail! Attendance at the research day is free, but registration is required (click here). Members of other dementia research networks are welcome to attend, but priority will be given to local researchers. How do people with dementia and their family carers manage medication-taking? You can now register for free for the annual Oxford Research day jointly organised by NIHR Oxford Health Biomedical Research Centre and ARUK Oxford Local Network. 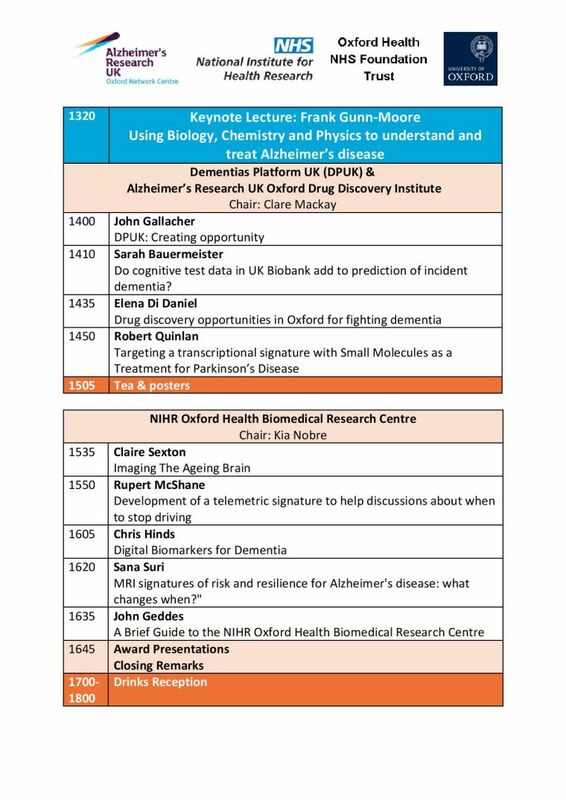 There will be a day of talks celebrating the exciting research in the region including updates on some of the exciting big dementia research initiatives such as the ARUK Oxford Drug Discovery Institute, Dementia Platform UK, the NIHR Oxford Health Biomedical Research Centre and the Oxford Momentum Award. Our Keynote speaker will be Professor Frank Gunn-Moore from the University of St Andrews. His research covers many disciplines and he will be talking on "Using Biology, Chemistry and Physics to understand and treat Alzheimer’s disease"
Accredited for 5 CPD credits. We hope you will join us for a day of stimulating research talks and posters, with plenty of time for networking and discussion, including an evening drinks reception. The Oxford Memory Research Day was held on 13th July 2016 at St Anne’s College, Oxford. This event was jointly organised by OxDARE and the ARUK Oxford Network. The theme was memory and showcased the latest developments in memory, dementia and ageing research from cells and animal models to cognitive neuroscience and the clinic. 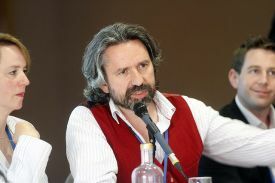 The keynote speaker was Kim Graham, Professor of Cognitive Neuroscience in the School of Psychology at Cardiff University. More details on the day can be found here. Download the full programme for the day. The second Oxford Dementia Research Day was held on Thursday, 16th July 2015 at St John’s College, Oxford. 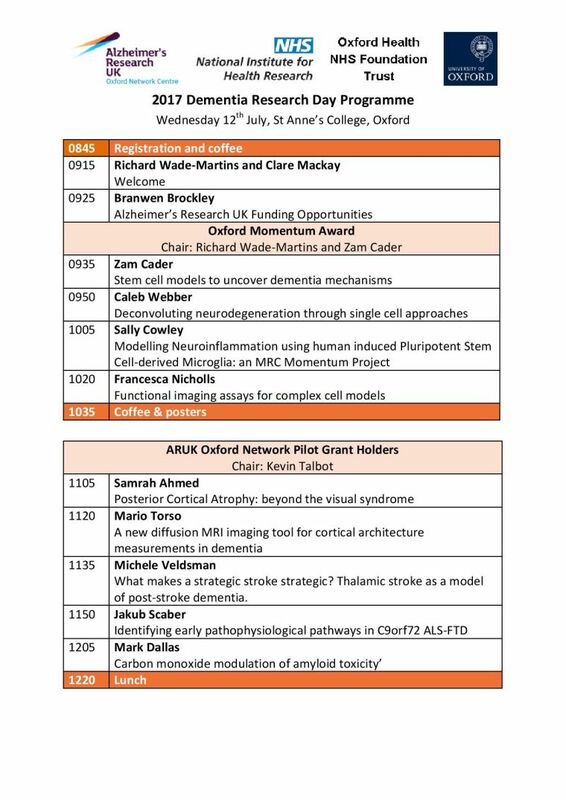 This event was jointly organised by OxDARE and the ARUK Oxford Network and offered the chance to hear about the latest developments in dementia and ageing research (Click here to download PDF of programme). As well as fascinating talks and posters the programme featured a meet and greet networking session for early career researchers.